What did LePage gain, lose from his rant against Democrats? AUGUSTA, Maine — Gov. 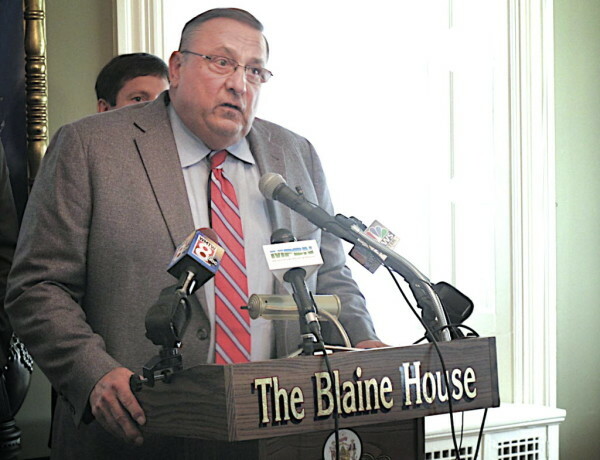 Paul LePage held an impromptu news conference Friday at the Blaine House that likely will go down as one of the most noteworthy public appearances in his second term, if not his entire tenure as governor. Flanked by three like-minded House Republicans and facing a roomful of reporters, LePage alternatively was forceful, thoughtful and insulting to his political opponents. He assailed Democrats relentlessly, which is nothing new, but also acknowledged that several Republicans — particularly those in the Senate — aren’t on his side, either. There were flashes of the bombastic behavior that won him fame — or, from some perspectives, infamy — during his first term, but also evidence he has a complex and detailed vision for Maine and will pursue it regardless of who stands in his way. The first session of a divided 127th Legislature is in its closing phase — hopefully, for the sake of avoiding a government shutdown — of amending LePage’s $6.57 billion biennial budget proposal and considering dozens of bills he proposed. With his tax reform proposal at failure’s door, the short view tells us LePage’s political capital is spent, but is it really? What did LePage gain in spending more than 50 minutes lobbing verbal salvos at his political opponents and laying down a partisan gauntlet during Friday’s news conference? He established he is at war with Democrats, no matter what. — He said House Speaker Mark Eves of North Berwick should “go back home to where he was born” and said Senate Minority Leader Justin Alfond of Portland should “be put in a playpen.” The latter putdown continues LePage’s years-old and oft-repeated assertion that Alfond is immature. — He said Assistant Senate Minority Leader Dawn Hill of Cape Neddick “insulted” him by filing a Freedom of Access Act request for communications between his office and the PUC. — He said he will spend the remainder of his second term holding town hall-style meetings “to convince Maine people that the Democratic Party is not the party of the people.” Again, the “take it to the people” approach embodied by an emphasis on public forums and apparent disdain for open records laws reinforces past LePage themes he communicates better directly with everyday Mainers than to them through the media — with its tools that include FOAA — and legislators. All of that ignores that LePage started a conversation about meaningful tax reform in January and that Democrats showed they were willing to engage in a debate with the release of their own proposal. Republicans also outlined a proposal, but LePage showed no support for either plan. As a result, the prospect of large-scale tax reform likely is dead. He will continue to fight to eliminate Maine’s income tax. LePage has proposed a bill that would trigger a referendum to ask Mainers whether they want to eliminate the income tax and assailed Democrats for opposing it, even though it has yet to come to a vote in the Legislature. The governor said Friday that if the bill is defeated, he’ll spearhead a petition drive to force the question on the ballot. LePage will go to any lengths to achieve his goals, even going against the will of the voters and the decisions of the Legislature. LePage had no apologies for the fact he is standing in the way of $11.5 million in bond funding for the Land for Maine’s Future program, even though those bonds were approved by Maine voters. “All they’ve got to do is meet some of my requests,” LePage said, referring to his demand the Legislature enact his proposal to use proceeds from harvesting timber on public lands for an energy efficiency program. LePage also said, for the second time since becoming governor, he’ll veto every single Democratically sponsored bill that comes to his desk, regardless of its merit, unless the Legislature approves his proposal for the income tax elimination referendum. LePage seems to be on a shrinking and increasingly deserted island, even among Republicans. Few Republicans have voiced full support for LePage’s tax reform plan, mostly because it calls for a massive sales tax increase and expansion to offset some of the proposed income tax cuts. LePage acknowledged that Friday, at least as far as Senate Republicans go. While Republican leaders in the House, a minority, joined LePage at Friday’s event, Republican leaders in the Senate, where the party holds a strong majority, did not. If you work for state government and don’t do what LePage wants, you’re fired. After years of denying it, LePage acknowledges his actions are political. A theme of LePage’s first term and both campaigns was “People Before Politics,” but he said Friday he’s “finally learning to play the game of the politician” with action such as attempting to trade conservation bonds and vetoing every Democratic bill.